It was very difficult to find the Supershuttle at the airport - no signs and no one seemed to know until an airport cleaner helped us. It seemed that as the drivers pulled in they had to take bookings for passengers. All up, we waited 1.5 hours for a Supershuttle vehicle to take us to our destination. It was the most disorganised service ever - it would have been easier to take a taxi and for only a bit more money. Poor service, not good value for money. Our voucher was refused by 2 shuttles when we got to the stop we were told to ring a local number to find out why. I also phoned the number on my booking but both guys said they didn't understand why the voucher was refused. They did arrange a shuttle to pick us up but by the time it got to us we'd had to wait for over 30 minutes and it had cost me over 8 to make the 2 calls. Very disappointed. It then took the shuttle over an hour to get us to our hotel. Absolutely disgraceful service. Arrived at LAX really tired. Found Super Shuttle woman who informed me my transfer to the Beverley Hills Hotel would be there in 30 minutes. Waited 1 hour and 20 minutes. When I enquired as to when my shuttle would arrive, the female representative clearly didn't have a clue what she was doing and was extremely rude just kept telling me in broken English that she didn't know. While I was waiting I counted more than 20 Super Shuttle buses stop to take people to other hotels. When my shuttle eventually arrived the driver was very aggressive and asked me for the address my hotel - the Beverley Hills Hotel a famous, iconic hotel. Because I'm not from the area I struggled to find the address and the driver told me I'd have to get off the bus. Eventually one of the other passengers gave him the address. I will NEVER use this service again and I was not the only person who was dissatisfied with the service. Great, got to LAX in plenty of time. Great service as usual. First problem is having to call to confirm the pick up 24 hours beforehand. I always had to wait in a phone queue for around 15 minutes before speaking to an advisor. On each occasion despite the paperwork having three different reference numbers on it my reservation could never be found and I had to rebook. 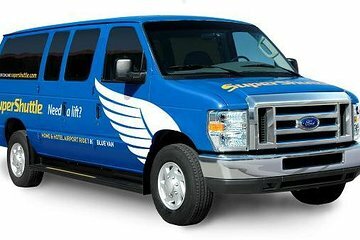 When we arrived at LA airport we followed the instructions to find SuperShuttlle as given on the paperwork. The information was completely wrong and the stand was located in a completely different place. We spoke to the representative there and he said we would have to wait. We waited, and waited and waited and waited. Empty vans arrived and were waived on time after time. Eventually we were beckoned over to get into a van. There were already another 5 drop offs in the van. We set off, did about 100 yards and were flagged down by another representative who asked our driver to do a favour and pick up another two drop offs, making 7! The traffic was horrendous, his driving was as bad, as was his attitude. Needless to say we eventually arrived at our hotel 1.5 hours later! We were not impressed. For the price it was fine. We had to wait a while and full van a bit uncomfortable but would still recommend for affordable travel to hotel. There was a lot of confusion initially, but once things were sorted out it worked fine. I followed the instructions and found the SuperShuttle stand just outside the terminal. Unfortunately, there was no attendant so every time a van stopped, we all asked if it was the right one. I was continually told to wait for the next van. Finally, we were told that there was another stand with an attendant down one terminal. I went there and things were sorted out quickly and I was on a van within 10 minutes. Lesson: Find the stand WITH an attendant. Very easy to find the Super Shuttle, Kind Staff, the Driver was very helpful. We were a little confused when we arrived at the airport. The instructions were to call when arriving. In actual fact if we just went out of the airport at the pick-up area, which we eventually did do, all would have been smoother. Drive went well to the hotel.